Cherry blossom buds which were stiff and rounded last week bloomed, almost all at once, this week. Since 1st April is the beginning of the fiscal year, the cherry blossoms are like the flowers celebrating those in their new start. Events and gatherings to welcome the new comers are taking places under the lovely cherry blossoms outside. Consumption tax increased from 5% to 8% from 1st April which wasn’t a pleasant start for the consuming public nor the retail stores. Still, we hope that the consumption won’t drop if people were to turn their eyes on beautiful nature which the season brings, attempting people to go out and spend their time refreshing themselves outside their homes. Sunshine is warmer now, even hot if you stay in the sun long, with the wind more of the breeze with fresh green or flowery scent around Tokyo. Famous cherry blossom spots as Chidoriga-buchi, near Hanzo-mon, the west gate of Tokyo Imperial PalaceW and Ueno ParkW are at full bloom now where many people gather day and night to see and have their picnic parties. Besides cherry blossoms, magnolia, camellia, rhododendronW and many other flowering plants are starting to bloom like as if they were also celebrating the long-waited season. If you have never been to Japan, we suppose it is the best season for your first visit at this time of the year as it should be a good climate to stay for both from cold or from hot districts. And to those who hate bugs, less bugs at this time of the season! 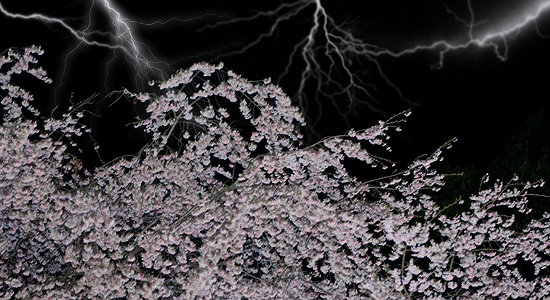 Beautiful contrast of the lightning and cherry blossoms of spring night in Japan. Weather at this time changes quickly which means that there are some rainy days but doesn’t exist long. It may be also a season in Japan when you can see various sorts of scenes of a place in a short time. Hot, summer-like daytime and cool, even chilly, winter-like night. Sunshine but suddenly rain. You may have a chance to hear or see thunder which rolls for a short time which is one of the reminder of the season and mentioned in today’s season phrase, ‘Kaminari sunawachi koe-wo hassu’. 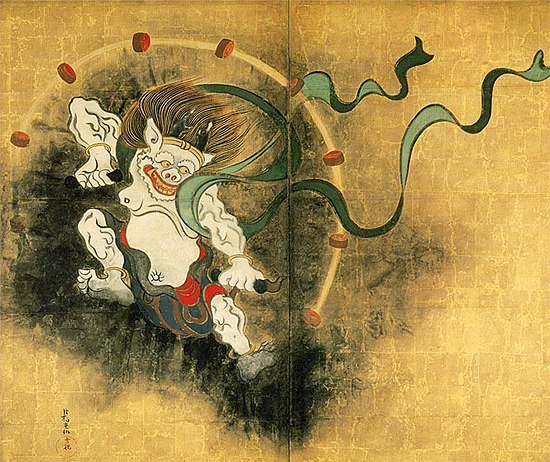 “Wind God and Thunder God”, a screen painted by Ogata KorinW, a painter of Edo periodW of Rimpa schoolW. ‘Kaminari’ is a Japanese for thunder and has been thought as a symbol of the god, TakemikazuchiW, in ShintoismW. The season sets forth a bit from now but thunder with its lightning was thought to play an important role in rice harvest. If we look at the Japanese word for thunder lightning, there is a word ‘Inazuma / 稲妻’ which literally means the spouse (wife in modern Japanese) of the rice plant’. Here, you could see that the natural phenomenon, the thunder, was given a personality as a god with his power casted upon the land as a thunder lightning, ‘Inazuma’, which the land , after being exposed to the light, as though the lightning and the rice plants were being married, was thought to bear the fruit of the rice plant. To our ancestors when rice farming was very important, the matter of rice harvest was the matter of life or death. Weather forecasting was very important like in agriculture today when there was no scientific equipment to estimate the right climate but they used their experience and data which their ancestors had been passing down to them. As you can see, reading through our past ‘Koyomi’ articles, many season phrases are based on agricultural timings. Again, today’s phrase mentions about the thunder which is going to be more important in later season when the rice plants are planted in the rice fields but should be keeping attention to from now. Going back to the phrase, ‘Kaminari’ is followed by an adverb ‘sunawachi’ meaning that is. The next word is followed by ‘koe-wo’, a Japanese noun and a case-marking particle meaning the voice. You could see that the thunder is given a personality here too, not transacting the sound of the thunder as a ‘sound’ but as a ‘voice’. The last verb, ‘hassu’ means to give or utter (a cry). Therefore, the meaning of the whole phrase would be, ‘the thunder which its voice utters’, telling us that the thunder starts to roll but still in a short period of time which should be more frequent and longer as time passes. Finally, there is a specific Japanese word for the thunder at this time of the year as ‘Shunrai / 春雷’ which has a meaning of creature-awakening thunder. It was thought to be the thunder which wakes the creatures which were hibernating during the winter, a word used often in classical Japanese poetries read in this time of the year. One of the delights you could be having in spring is to hear wild birds sing their love songs. In Tokyo where busy traffic is almost endless throughout the day, it could be hard for to hear any birds sing. But if you are lucky, staying near the large park where green is enough, you may hear some birds singing early in the morning. Still, it is best to go out the busy area if you want to hear how the Japanese wild birds sing. 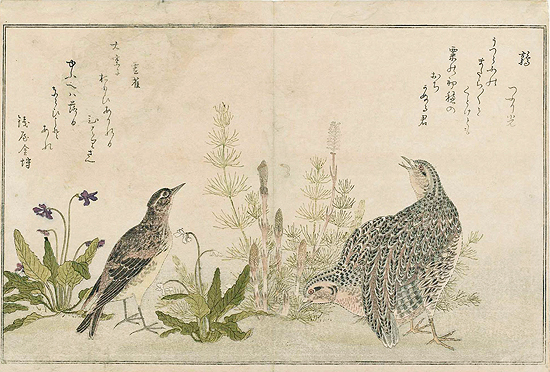 You won’t have to travel far to hear the birds which has been familiar to the Japanese from the past, many written in literature or described in arts. 30 minutes on express train or an hour drive in a car from centre of Tokyo will take you to the place. 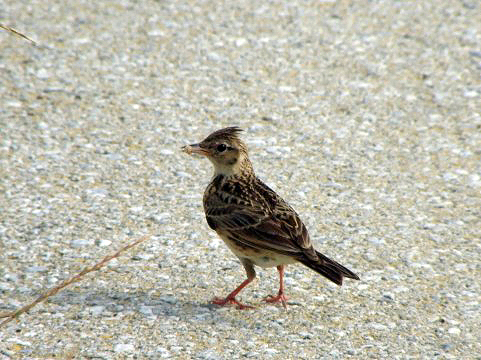 Hibari, Eurasian Skylark. Not so attractive looking bird but their songs are really outstanding! There are many birds singing at this time of the year in Japan with their characteristic songs which among them, maybe the easiest to identify, is the ‘Hibari, or the Eurasian SkylarkW. We say easy because if they are there, you could easily find them with their outstanding songs which echo high above the sky, throughout the rice fields which have been stared to plough. It is hard to find them not singing as their features are not outstanding but finding them when they are singing as they fly up high in the sky will be easy though you will need sunglasses to avoid the sunlight getting directly into your eyes. They sing so merrily and hurriedly in a certain rhythm when they fly upwards, coming down in another sort of song again merrily but in a little downward-tempo as if they know that they are darting down. Their songs are really unique which could be heard at the link below. We have heard of lark in England but they seem to sang in a different way to Hibari in Japan. How about the lark in your country? Like the Uguisu, of Risshun, Jikou article written in our past article, Hibari was considered as one of the birds that remind the Japanese of spring. Both are birds which sing beautifully with the arrival of spring in Japan and are both the symbolic words to express a girl or a woman with beautiful voice. For instance, a woman announcer is called ‘Uguisu-jo’, meaning Uguisu lady, or the most famous postwar female singer in Japan’s name is ‘Hibari MisoraW’. 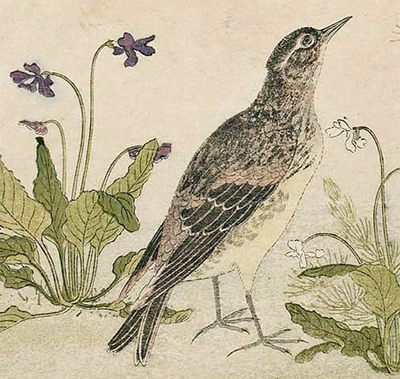 Ukiyoe of Hibari and quail by Kitagawa UtamaroW. He has written his own poem on both birds, “”Hibari as rich, wealthy bird flies high into sky would last not until the evening, which we should learn”, appealing his opinion on wealth and fame won’t last forever. The oldest Hibari was described as a seasonal word of this time of the year in ManyoshuW, the book of poetry collection complied in 759. On the other hand, Hibari has been one of the hero / heroine of some fairy tales in some areas as moneylender to the sun. It is funny that because the sun did not give back what he owes Hibari, Hibari flies high and sings, counting the interest. As you can see, Hibari has long been a cherished bird which were also kept as a pet to contend for superiority of their singing and the flight height until late 1970’s. It is prohibited to keep the Hibari now under the Japanese law so if you want to hear them sing, go and hear them in the countryside at this time of the year. We are sure you’ll like them sing merrily, making you happy! Hibari standing by the violet.